I’ve been testing things on Beta and on the whole, have found myself falling in love with the game again. Of course there are things I don’t like (Snow has massive class hall envy for example) but that was always a given. Unless I designed the game myself, I was never going to like every aspect and if I designed it, there would be a lot of very unhappy Ret Paladins, Death Knights, Arms Warriors and Frost Mages out there. Anyway, here are three screenshots which highlight the completely random things I’m especially excited about. 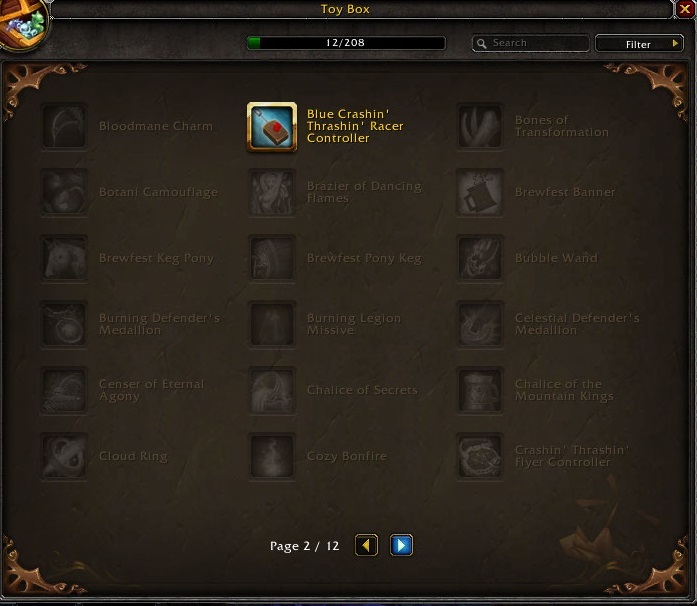 One of my favourite new additions to Warcraft is the Toy Box. I find myself almost wishing that I didn’t have to wait another few days for the next patch before this feature is released into my hot little hands. It’s first of all a list plus it’s going to free up beautiful and desperately needed bag space across so many of my characters so what’s not to love. I’ve tried to be a bit systematic here, things I’m currently attempting to farm are green, items which aren’t yet available in game are red and items which come from Trading Cards are purple. Anything which is purchasable for any sort of currency whether gold, Timeless Coins or some sort of token is orange. Ai-Li Skymirror – Not yet owned. Drops from the mob of the same name in the Dread Wastes. Ancient Amber – Acquired by Fossil Archaeology. Argent Crusader’s Banner – Not yet owned. Sold by Dame Evniki Kapsalis at the Argent Tournament for 15 Champion’s Seals. Arrival of the Naaru – Not yet owned. Draenei Archaeology. Ash-Covered Horn – Not yet owned. 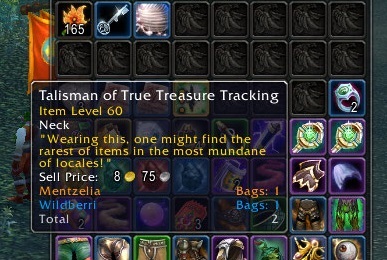 Drops from the High Priest of Ordos on the Timeless Isle. B.F.F Necklace – Drops from Huggalon the Heart Watcher, a level 92 Elite who resides in a cave in Townlong Steppes. Battle Horn – Drops from Blackhoof, a rare spawn in the Valley of the Four Winds. Blackflame Daggers – Drops from Champions of the Black Flame on the Timeless Isle. Blazing Wings – potentially available at November’s Darkmoon Faire from completing the achievement Brood of Alysrazor which requires you to fly through 50 hoops. My only experience doing this comes from the beta a few builds back but it was fairly easy then as long you mapped out your route as you went. Blessing of the Old God – Not yet owned. This is a rare Nerubian archaeology solve. 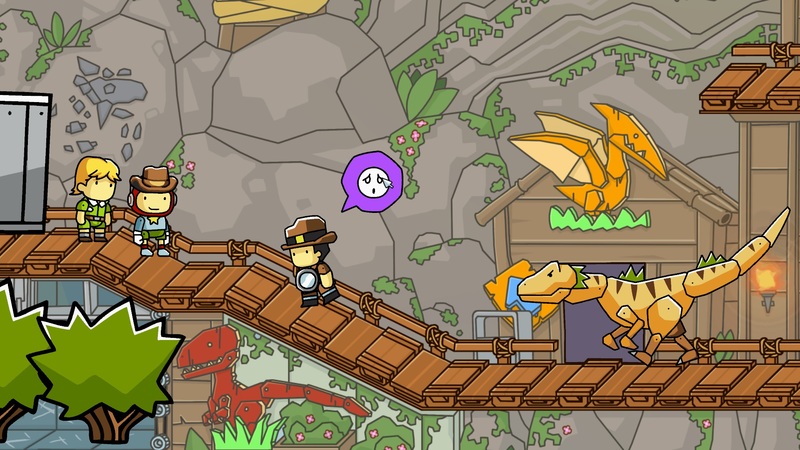 So to sum up page 1, that’s currently 8 items definitely not obtainable until the expansion starts in earnest with a further one item as a maybe. Then we have three things from varying branches of Archaeology, 5 drops from various mobs currently in-game and one item purchasable for Champion’s Seals. As things stand out of these 18, I possess a whopping four items, although I do have enough seals to purchase the Argent Crusader’s Banner so I suppose my current score for page 1 is 5/18. Blue Crashin’ Thrashin’ Racer Controller – Can be bought from Jepetto Joybuzz and his clockwork assistant in Dalaran or Craggle Wobbletop and Blax Bottlerocket in Stormwind and Orgrimmar respectively. Bones of Transformation – A rare item from Night Elf Archaelogy. Not yet owned. Brazier of Dancing Flames – purchasable during the Midsummer Fire Festival for 350 Burning Blossom. Burning Defender’s Medallion – not obtainable until the expansion. Will require Midsummer Fire Festival 2015. Celestial Defender’s Medallion – Requires revered with Emperor Shaohao. Not yet owned. Chalice of Secrets – Drops from Urgolax, a rare spawn in the Vale of Eternal Blossoms. Chalice of the Mountain Kings – A rare item from Dwarven Archaeology. Cloud Ring – Requires Order of the Cloud Serpent – Revered. Costs 1000 gold. Cozy Bonfire – not obtainable until the expansion. Will require Midsummer Fire Festival 2015. Crashin’ Thrashin’ Flying Controller – Gift from Winter’s Veil 2013. Crash’in Thrashin’ Robot – made by engineering, the schematic is a world drop from various TBC mobs. Crash’in Thrashin’ Shredder Controller – Not yet available, requires Winter Veil 2014. Cremating Torch – Reward from the quest Choking the Skies in Townlong Steppes. D.I.S.C.O – Trading Card item from the “Hunt for Illidan” expansion. Darkmoon Whistle – sold by Gelvas Grimegate at the Darkmoon Faire for 90 Darkmoon Faire tickets. Darnassus Banner – Sold by Rook Hawkfist, Darnassus Quartermaster at the Argent Tournament for 15 Champion’s Seals. Decahedral Dwarven Dice – requires Pickpocking. The best place to try seems to be New Hearthglen. Demon Hunter’s Aspect – Trading Card item from the “War of the Ancients” expansion. Elune’s Lantern – Reward from defeating Omen at the Lunar Festival. Essence of the Breeze – Drop from Ai-Ran the Shifting Cloud, a rare mob in the Vale of the Eternal Blossoms. 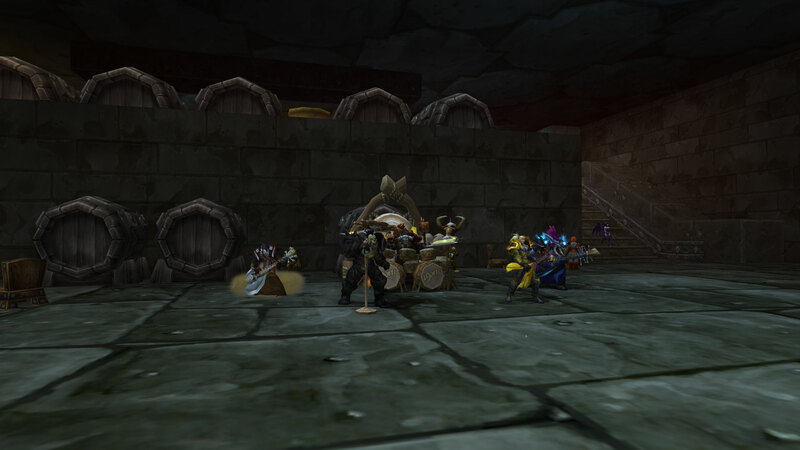 Eternal Kiln – Drops from the Eternal Kilnmasters on the Timeless Isle. Everlasting Alliance Firework – This was a reward from completing the Theramore Scenario prior to MoP being released. Everlasting Horde Firework – This was a reward from completing the Theramore Scenario prior to MoP being released. Exodar Banner – Sold by Irisee the Exodar Quartermaster at the Argent Tournament for 15 Champion’s seals. Faded Wizard Hat – Reward from quest in Aszhara. Horde only. Farwater Conch – Dropped by Zai the Outcast in Kun-Lai Summit. Firefury Totem – Not yet obtainable. Fishing Chair – Trading Card Item. Flimsy Yellow Balloon – Currently purchasable from Carl Goodup at the Darkmoon Faire for 10 silver. However will require November’s Darkmoon Faire as it currently disappears after the Faire leaves town. Flippable Table – Sold by Nam Ironpaw for 40 Ironpaw tokens at the Half Hill Market. Foam Sword Rack – Trading card item. Fool’s Gold – Trading Card item. Foot Ball – Can be bought from Jepetto Joybuzz and his clockwork assistant in Dalaran or Craggle Wobbletop and Blax Bottlerocket in Stormwind and Orgrimmar respectively. Foxicopter Controller – Purchasable from Sally Fizzlefury at Nesingwary’s camp in the Valley of the Four Winds for 1000 gold. Frenzyheart Brew – Requires revered with the Frenzyheart faction in Sholazar and then it’s a chance to get from a ripe disgusting jar. Glorious Standard of the Kirin Tor Offensive – reward from completing the quest Securing a Future in the Throne of Thunder. Well based on the first four pages, it’s going to be while before I get my hands on the achievement and reward for 150 toys. So far I have twenty two of these out of a possible 74 with a further 22 unavailable until Draenor aligns itself once again with Azeroth. Mr and Mrs WoW have proposed an interesting community project to combat the negativity bouncing around as we slowly drift through the doldrums. They are asking the community at large to inform them what we love doing in Warcraft in these slow days before the expansion is released. For me it’s a fairly simple list and I hope my little diagram gives a few hints! 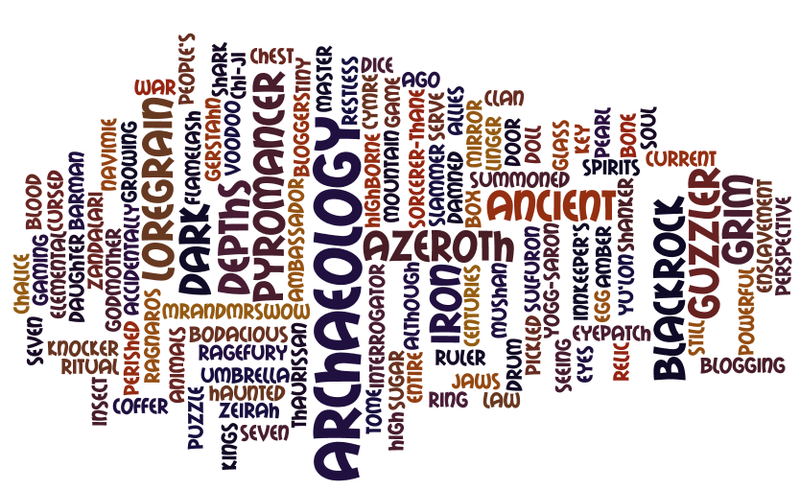 Up there at number one is Archaeology because it gives me the opportunity to wander around Azeroth just as I used to do whilst herbing in the original game. 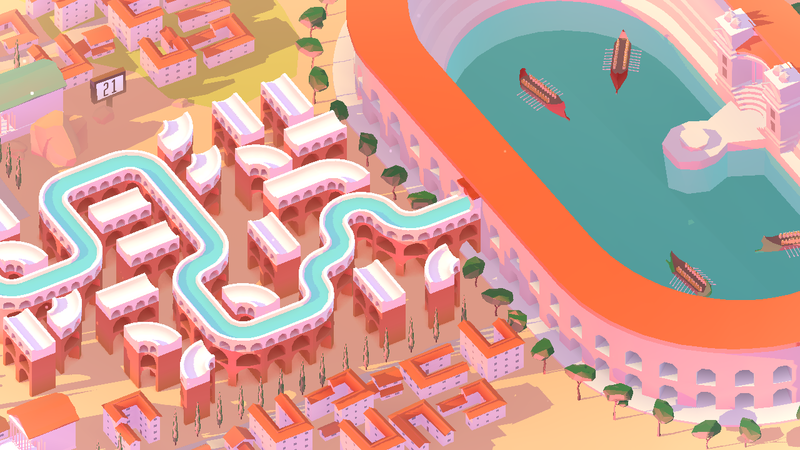 It’s an excuse to relax, look at the scenario and perhaps kill a few mobs or do a spot of fishing as you meander past. On top of that, you also make things which provide the opportunity for either toys or grey items to muse over, perhaps sparking a story or two. My second choice is exploring old dungeons, the ones I’ve run a thousand times before but never used to stop and take in the scenery. Blackrock Depths is a definite favourite because I like hanging out in the Grim Guzzler picking up Dark Iron Dwarf outfits (my old raid leader really hated these) and the odd pickled egg. The music isn’t too bad either and you can always pick up a few items of clothing to help transform your latest outfit into something even better. Third I’ve picked Festivals, those annual excuses to get out of the cities and wander about visiting zones you haven’t seen in ages, dressing up and generally being silly. My favourite of these is Hallows End with it’s broomsticks, headless horseman and candy but really I’m a sucker for all of them, even the weekly Wanderer’s Festival. My final choice is a bit a cheat really. It’s not so much something I do in WoW but something I do in between playing and that’s catching up on what the rest of the community are doing and saying. Sometimes it takes someone else’s perspective of something like Pet Battling to change your own perception of it (Thanks Navimie and Cymre). I hated archaeology when it was first introduced but I remember reading someone’s almost ode to the wonders of digging in Azeroth’s fertile soil (can’t remember who wrote it) and became hooked. The Godmother helped alter my feelings towards Garrisons and so on. Playing a multi player game is one thing, but diving into the community shows a whole new world out there. Pre Warlords to do List – It’s Panic Time! So we have three months almost to the day and it’s time to start panicking in this neck of the woods. I am however trying to keep both lists relatively short to save myself getting distracted. Level a Warlock to 90 and attempt to get Green Fire. I’ve no idea how possible this is, leveling itself won’t be an issue as I have multiple Warlocks to choose from but whether I can level, gear to a decent enough standard and beat the boss in time I’m not sure. 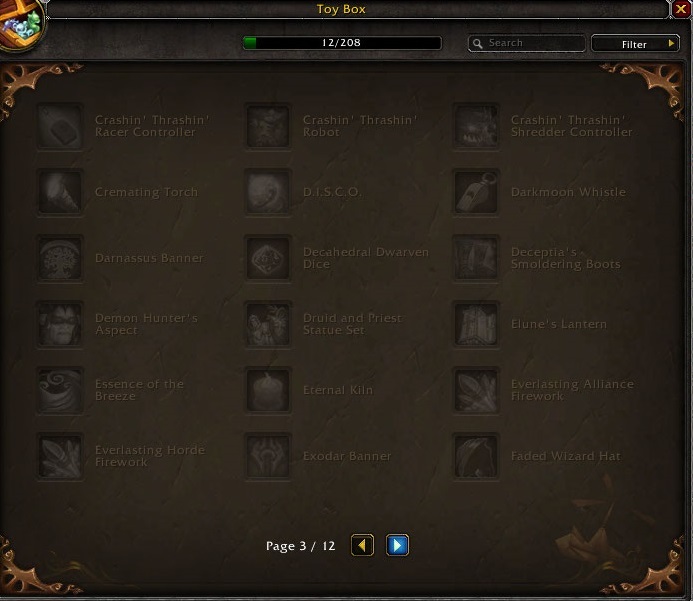 Acquire as many of the items on the Toy Box List as possible. Due to the sheer size of this, I’ll probably do a separate post or series chronicling my attempts to achieve this. 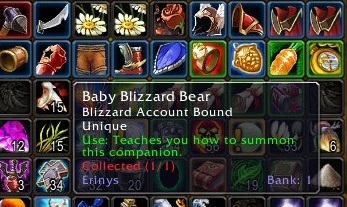 Sort out Snowflower’s transmogrification requiring items from UBRS asap as the dungeon will clearly be changing prior to Warlords being released. Attempt to get Dulcamara to the end of the Brawler’s Guild. She’s rank 7 at the moment but has received a few upgrades since my last attempt at beating the fight she was stuck on. If I keep failing as a Mistweaver, I will try speccing dps to have a go. My focus with List Two is more to keep things ticking over, for example when I’m running UBRS I’ll try and remember to use a tabard to finish up my Panda Rep and whenever the Faire rolls into town, I’ll do a couple of dailies and my profession quests. 60 exalted reputations on Snowflower. Whilst this would be great before November, there are new reputations coming with the expansion and I’m not missing that many. 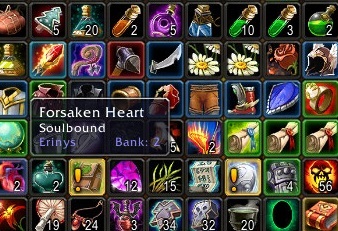 Enough Darkmoon Faire tokens tucked away to purchase the new clothing coming with the expansion. Farm the other 8000 Dinosaur bones I need for the White Raptor. Riding it on the Beta has shown me how lovely it is. Farm around 300 Oshu’gun Crystal Powder to get the two Halaa mounts. I have the kill tokens I need so slaughtering some Ogres in practice for the expansion should be easy enough. I’m sure there are a thousand and one other things but to begin with at least, these eight should keep me out of mischief. Just before I went away for the weekend, the Godmother raised an interesting set of questions on our WoW experiences over the last 10 years and whilst wandering around an art festival and trying not to be sick on people for the last two days, I’ve been mulling over my answers. Wandering the aisles of our local supermarket, Mr Harpy picked up WoW from the shelf and suggested we give it a try. We weren’t long back from almost a year of travelling and were looking for some sort of distraction to help us readjust back. He had played all the previous Warcraft games and was a big fan of the franchise. I on the other hand had only played Warcraft III: The Frozen Throne which we had picked up whilst travelling through Canada the previous year. I had no idea what a MMO was and certainly no clue what we were getting ourselves into. At first we just bought one copy to see if we liked it and at first, I quickly bored of the whole thing. In fact it was only by level 10 or so that my interest was sparked again and I think that was by the sheer size of the game, oh and the sea monsters off the coast of Darkshore. In my absence Mr Harpy had managed to join a Guild full of Female Nightelves and imagine my surprise when I discovered that 99 percent of them were played by guys (I may have been slightly more naive at that point) and once I got over the shock of chatting to “real” people through a game, I started to enjoy myself more and more. In the end buying my own copy seemed like the right thing to do and we did, driving an hour to track down another copy. 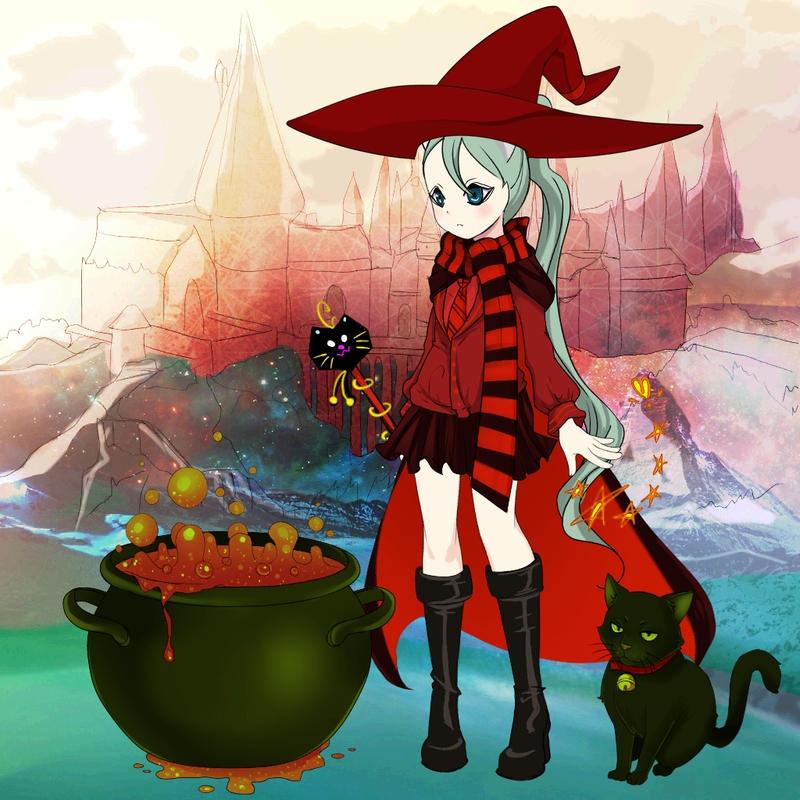 The first character I rolled on my own account was a Human Female Warlock. I still have her and by coincidence she was on the realm which was recently joined to my current server so ideally I would like to level her from 62 to the cap at some point. She reached Knight-Captain in those early days of the Honor system before being abandoned for a Priest and a PvP server, thus wears her PvP gear with pride and a certain amount of snark, reminding me that she could have gone all the way had I not left her for bloodier pastures. Her bags do make for an interesting time capsule with their Darkspear Troll Mojo (apparently I really didn’t like Trolls) and her Thrash Blade though. Whilst I did love playing a Warlock, the whole soul shard thing in world pvp was a pain especially given that you had to travel quite a distance to find high enough level mobs from both Hillsbrad and the Barrens plus the summons whispers… grrrr. So whilst Mr Harpy was busy installing our first copy of World of Warcraft, I was flicking through the manual making important decisions like faction, race etc etc. I wanted us to roll a Druid and looking at the pictures, Nightelf catform beat Tauren catform hands down. I know, I know….. We have since then played both factions and I am rather partial to the Forsaken but we still play Alliance primarily. After lots of reflection, I think three person healing the end of Anub’arak 25 man Heroic to our first kill has to be the most memorable. Killing C’thun at the time was amazing but we had weeks and weeks of preparation leading up to a sensible kill, clearing Ulduar and getting our Proto-drakes was pretty good as was getting my legendary and of course my Benediction but Anub’arak wins out because it was such a close run thing. Half our healers were dead and people were thinking it’s wipe but somehow, the three of us managed to keep ourselves, the two tanks and enough DPS alive in order for us to get a kill. My hands were shaking so much that around 8 seconds after the giant undead bug keeled over, I died too having too excited to bother healing my debuff any more. Although beating an Arms warrior in vanilla on my Priest for control of the mine in Arathi Basin was pretty sweet too. The sheer scale of it. Feel like Healing, join a battleground or dungeon queue. 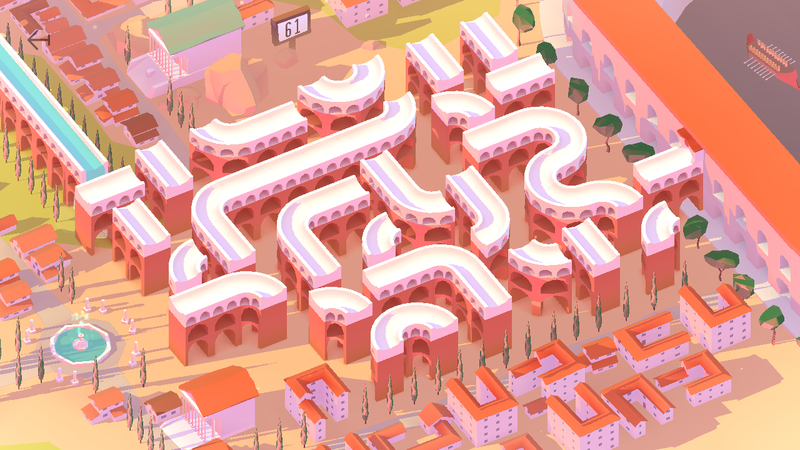 Feel like wandering around by yourself, go for it, there’s plenty of places to go. There was a time when I would have instinctively picked Healing as an answer to this and I do still love it but my anxieties mean that I have increasingly found it hard to partake in this social aspect of the game. I’m hoping that with this new expansion I’ll be able to conquer that, but the truth is, I suspect that I’m just too emotional fragile at the moment. 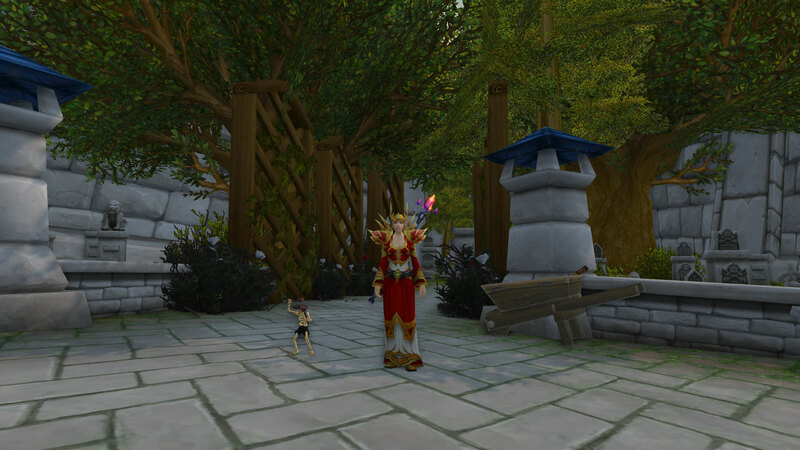 Duskwood has held a fascination for me since I first set foot across that rickety bridge almost 9 and a half years ago. I hang out in the Scarlet Raven or wander it’s boneyards visiting old friends. I especially love to visit at Hallows End when all the spooky decorations are out. 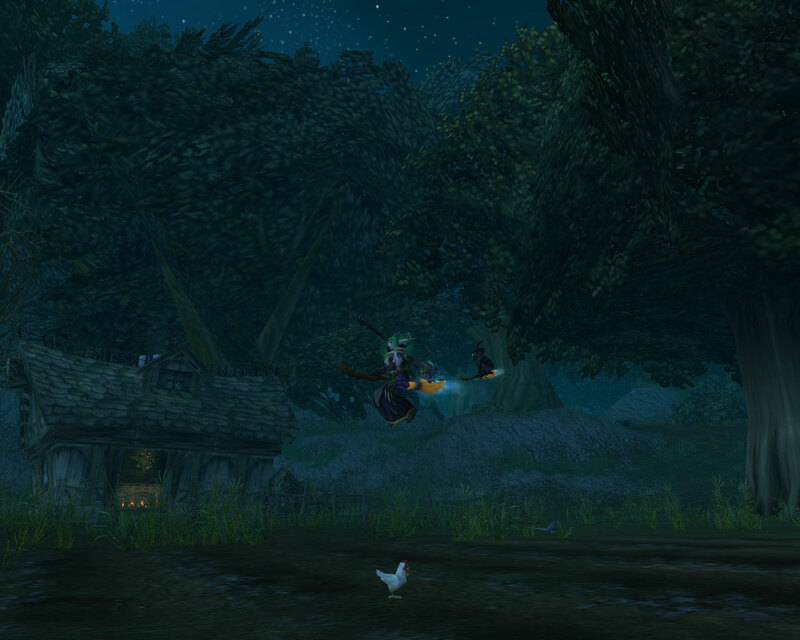 On the Horde side, I’d say Silverpine Forest is a clear favourite again especially at Hallows End. On my mostly main Snowflower I have 197 days played although I suspect if I logged every alt and added it all up, the total would be far more scary. It hasn’t been continuous as unfortunately I’ve witnessed more than I’d argue my fair share of in-game Drama. What with Guild leaders who hacked their own websites to read private messages, GMs who did a fair impression of Jekyll and Hyde, turning from a good laugh into a psychopath kicking people for nothing more serious than a slight mistake which they apologized for and just other general nastiness. There was a time when Mr Harpy ran a guild and was accused of running a Cult of Personality by the other officers because the rest of the guild didn’t respect them enough. This would have been funny if it wasn’t for the fact that rather than approach him, said officers thought that coming to me accusing him of being unfair made more sense. Sometimes you just need to run away before the madness gets to you. That’s before I even get into the loot drama, the general rows and spending most of vanilla in a top end raiding guild where everyone hated everyone else and healers were on par with Mages in Dragon Age, useful but best locked up somewhere and denied any loot which might encourage them into unholy ways. Always and much to the annoyance of Mr Harpy who doesn’t care about lore but just wants to know that he can aoe grind and get healed, not die whilst my nose is buried into quest text. To me the game is a bit like a choose your own adventure game and therefore you have to read the quest text otherwise you’re blundering around in the dark killing for fun and gold and fancy clothes not because X is bad and deserves to have their head cut off and carried back to Stormwind. There are a few occasions when I should have spoken up sooner and louder. On the whole though, there might be a lot of blood on my hands but I think my Nightelf Priest would be semi proud at least of the way in which I have carried her through Azeroth. Very little. My parents, my Mother in particular see gaming as some satanic ritual guaranteed to condemn you into a life of sin so discussing it with family is completely out. I have after all, enough to argue with my Mother about already. Blogging about the game has helped me keep my hand in with writing, something which was always a massive part of my life and I do have a Wind-rider club guarding my monitor.